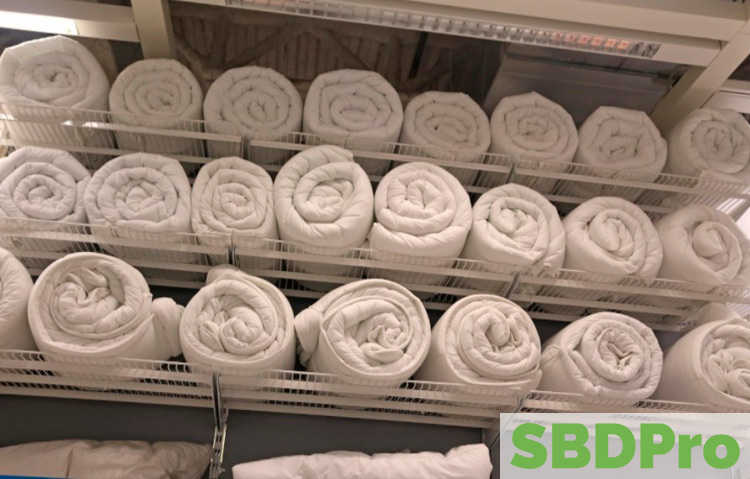 If you go online and search “how to care for wool bedding,” you will find a number of blurbs about cleaning wool, but there is more to caring for wool bedding than just cleaning it. The following information will fill in those gaps and also cover different cleaning techniques. Letting your wool bedding “breathe” is helpful. Here’s how: By giving it a few good shakes and hanging it on a clothesline, if you have one, air will sweep away dust and other debris that may have settled on your bedding. Fresh air will also remove household odors from your bedding. Additionally, sunlight is a natural disinfectant and can kill dust mites. So, remember to give your wool bedding some air at least once a month. This practice will extend its freshness between cleanings and help keep pests at bay. Should you let professionals clean your wool bedding? Maybe, maybe not. It really depends on you and your budget. For example, if you’re just not that into doing laundry, go with a cleaning service. On the other hand, if you are frugal, really particular about cleaning products or both, you can clean your own wool bedding. The process is not that complicated, especially if you have a top loading machine. If you decide to clean your wool bedding at home, the general consensus is that you should only use the gentle cycle wash option, a gentle detergent and warm water. You shouldn’t toss your bedding in your dryer after washing. You should let it air dry instead. After washing your wool bedding, you will need to remove the excess water — and there will be a lot of it! — to help it keep its shape as it dries. You can accomplish this by placing it in a tub or shower where you can roll it up like a knapsack and allow the water to go down the drain. You can also use a towel to help absorb the moisture. You should take note that this method may be more time-consuming than just rolling your bedding up in the tub or shower and pressing the excess water out with your palms. Additionally, you will also need to have a lot of towels on hand, which may not be an option. No matter which method you choose, you should never wring the water out of your bedding, no matter how tempting it is to do so. Wringing water out of wet wool will make it lose its shape. In most cases, you can also spot-clean your wool bedding. To do this, you’ll need is some hydrogen peroxide, vinegar or seltzer, water and a spray bottle. Remember to colorfast test prior to spot cleaning. What do you do when your bed itself is wool? A few things will help. First, if you do not already have one, invest in a mattress topper. These will spare your bed some unnecessary wear and tear. Flipping your bed at least twice a year will help extend its life. Bonus tip: Remember to let your bed itself get some air. Strip it before you leave for work, school, etc. Wool mattresses can also benefit from the same sun disinfectant that wool bedding can. Have you heard these myths about how to clean wool?